It's an all-new episode of the coolest movie trivia gameshow in the world! William Bibbiani and Witney Seibold represent Critically Acclaimed in a duel to the death with MODOK, comprised of Matt Atchity (What the Flick?!) and Grae Drake (Rotten Tomatoes). The winners will reign supreme! The losers will feel kinda bad about it! And they will ALL dress like weirdos! 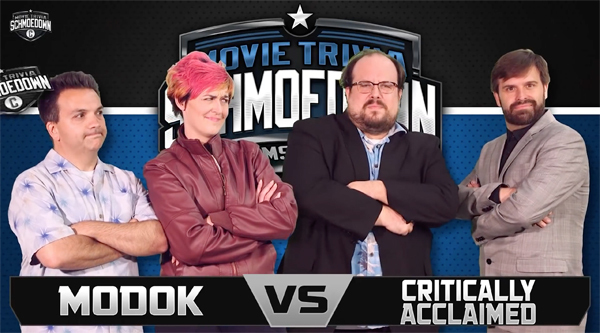 Who will win in the latest Movie Trivia Schmoedown, and what bizarre choice will make William Bibbiani tell his co-host, partner and best friend Witney Seibold, "I'm never trusting you again?" Watch the episode now to find out! The best pairing of teams and players! Pure fun, energy and charisma. I could watch this teams play every week.